How to help your distributors overcome failure. Use this simple story to help your distributors face the challenges when building their business. You don’t want to win the race to the bottom. Great third party validation for what we do as networkers. “Quitters” tip for fresher leads. I don’t know why distributors keep buying network marketing leads. It’s like being addicted to “crack.” Why? Every time you need to expand your business, you have to buy more leads. If that is the only way you know how to get leads, you are an addict, held hostage by the network marketing lead seller. But this post isn’t about how to create your own fresh leads. This post is how to be more effective if you are caught in the trap of having to buy leads. So let’s see how we can be more effective against our competition when we buy network marketing leads that are being sold hundreds of times to our competitors. A distributor buys some leads. That was the easy part. Leads are cheap. However, the follow-up time and effort are expensive. So what will most distributors do? They start with the “A” names . . . then “B” . . . and by the time they get to leads that start with the letter “C” – they’re already thinking of quitting. When you get your list of leads, start at the bottom. Start with the letter “Z.” Most quitters never get this far and these leads are virtually untouched. 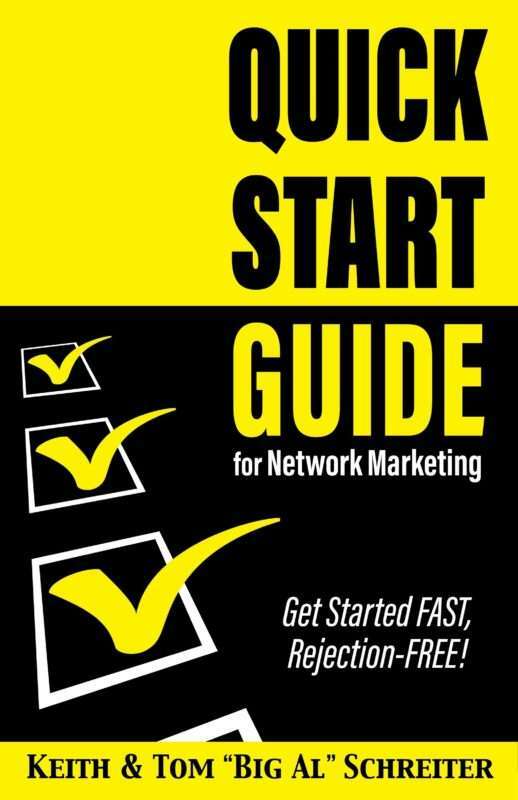 Does your network marketing company make you successful? Many new distributors in network marketing think that choosing a different network marketing company will make them successful. These distributors think that success is “outside” of them, and that the external factors will make the difference. But success in network marketing is an “inside job.” You have to learn some skills. And if you don’t have skills, changing companies just means that you’ll be unsuccessful in a different company. If you can’t recruit now, changing companies won’t fix that. In every network marketing company there are some successful distributors, and some unsuccessful distributors. So it is not the company that makes the difference. The Secret of Natural Attraction. I don’t know the secret of “natural” attraction, but I certainly can create attraction. You don’t have to be charismatic, brave, a superstar, or a magician to attract people to you. That’s great, because I am none of those. Want to attract people and prospects? Here are two ways. 1. Use something out of the ordinary. People lead boring lives. If you have a Chevy Lumina Stretch Limousine, you will attract all the people you want. Here is a picture of this “one of a kind” vehicle. My friend, Aaron, bought this vehicle from Tim Rose. Both report that everyone who sees the vehicle wants to rent it, or at least start a conversation. Maybe your product or opportunity lends itself to the extraordinary. If not, get a unique attraction magnet like the Chevy Lumina Stretch Limousine. 2. Attract people by having what they want. Having what people need is boring. People need insurance, mortgage money, food, cars … but that won’t motivate them to contact you. If you have what they want, people will come and stand in line. People need to see a dentist to get their teeth cleaned. No excitement in that. But if you have a toothache, you will beg for an appointment and never negotiate the price because you desperately want to get rid of the pain. People want a once-in-a-lifetime vacation, the dream car, to be debt-free, the chance to attend the Oscars, and to stay home with their family and have the life they dreamed about in high school. If you have these things, people will be attracted to you. So do you have a solution that can get these things that people want? If you do, all you have to do is attract all the prospects you want to your solution by using sound bites, magic sequences of words, word pictures and medium- to high-level communication skills.